This question is a common one, but one that often goes unasked as people are worried about seeming inexperienced or making a bad impression when they start their new jobs. Really, it’s a very reasonable question. Making a critical error would be far more costly than asking colleagues for help. You can’t just jump in and start Tweeting on behalf of a business you’re unfamiliar with. Every company has a different audience, different needs and goals for their social media presence. At the same time, you want to show initiative and jump right into your new role. Your first day or week at a new social media job should be spent doing a lot of listening and learning. You need to establish what works, what doesn’t, and what goals you’re trying to meet. To help you kick things off on the right foot, here are five things to do during your first week as a social media manager. Assuming the business that you join already has some social media presence, one of the first things you’ll want to do in your new role is to simply listen to their followers. Your followers are your best source of information and inspiration. At the same time, you should seek out and follow relevant hashtags to see what general news and chatter is popular amongst people in your new industry. This includes competitors. If a competitor has more followers or engagement than you, see what they’re posting and learn what you can from it. Create streams to track all of this information and check in regularly. You’d be surprised how much insight you can gain just by listening in this way. Check out the three ways to get the most out of social media listening. You may not be in charge of creating content, but much of your job will be spent promoting it. If you have access, take a look at the business’ Google Analytics. See what content from the blog or website has performed the best in the last year. Then, pull your social media analytics. Identify the posts and messages that have performed the best in the same period, and compare the two. Certain posts might work from an SEO standpoint but not on social networks and vice versa. You want to identify the posts that perform well in both areas and double down on those types of content moving forward. Don’t be afraid to share your insight with the content team. You’re both probably working towards the same goal, and even if you’re not this type of coordination is mutually beneficial. Looking at the best performing social media content will also offer insight into what type of messaging resonates with your audience. Look at the form of the Tweet or post (Where is the link? How long is the message?) and the language of the post (Was it humorous? Serious? Simple? Complicated?). 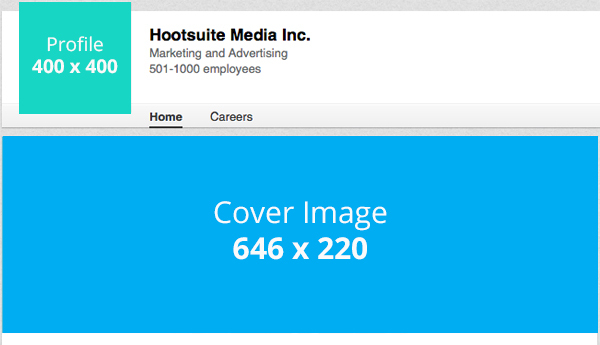 Pull out the top 10 or 20 best-performing posts on each social network and put them in a document. You can reference these later for inspiration. Here’s what we learned from our most popular Tweets. Once you get an idea of what the business’ social media presence looks like from the outside, it’s important that you speak with your new colleagues for an insider’s look. Ask employees what they know about the company’s social media. They may not know anything, and that in itself is valuable information. You’ll learn what departments are totally disconnected from your corporate social strategy, and can start thinking about how to get them involved. In the very short team, you can at least ask them to follow your company accounts. Employees, after all, make the best social media advocates. How often are employees outside of marketing are involved in social media activities? Do different departments run their own accounts? One of the biggest ways to make an immediate impact in your new role is by facilitating the process by which other employees work with social media. Identify ways to speed up the requests process. Plan training for staff so it doesn’t seem so complicated. Identify ways in which departments not using social media could be using it to make their lives easier. Talking to employees won’t just familiarize you with social media at the company, it will familiarize you with your colleagues, an important first step in any new role. This is an updated version of a post originally published in December 2014. Use this template to create a social media strategy that will guide you in your online activities. Answer the questions in each step to establish what your goals are, how you will achieve them, and how you will measure success. 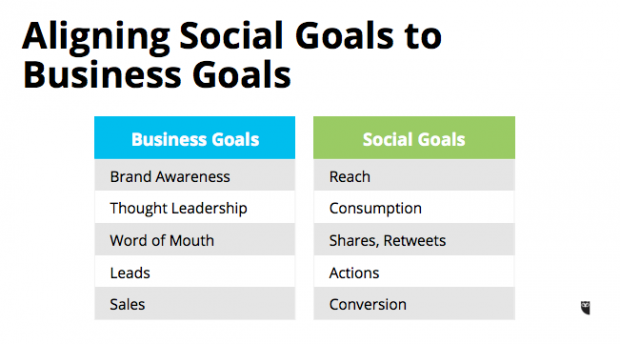 An important part of creating your social media marketing plan is conducting a social media audit. This audit serves to assess your current social media use and goals, and how they’re working or not working. 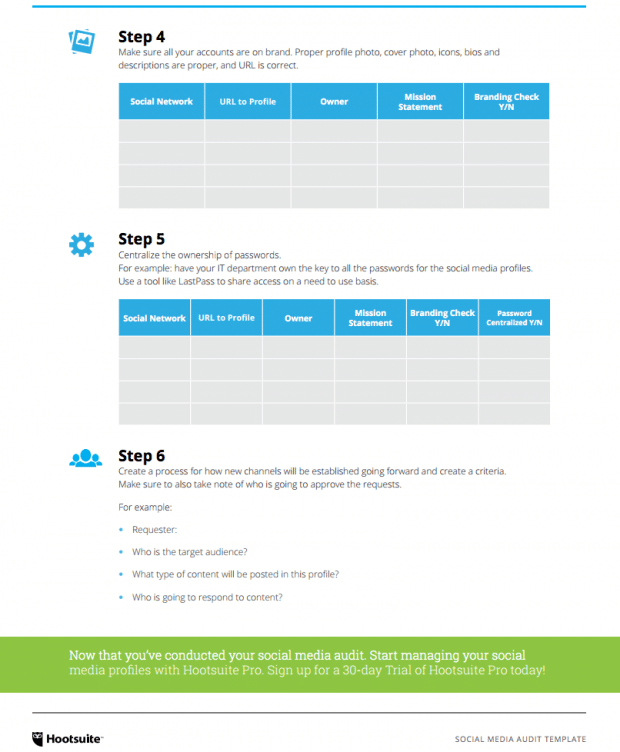 We’ve put together a social media audit template to walk you through the steps and help you conduct your audit more effectively. The easiest way to organize a content calendar is by using a separate ‘sheet’ within a Google or Excel Spreadsheet for each month. Activities can be broken down by day or hour, depending on the volume and cadence of your content plan. 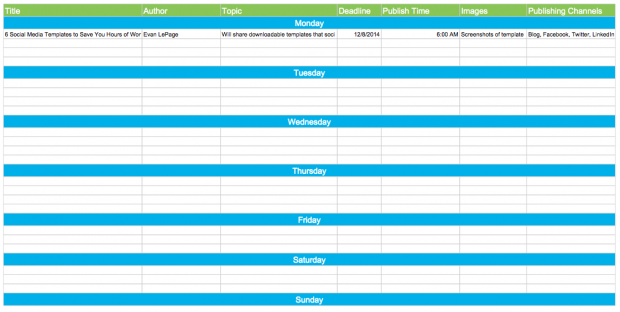 The second valuable content calendar is a social media content calendar. This should include all of the social media messaging you’ll be using to promote your content, organized by date and time. Social media engagement can’t be planned in advance, but social media promotion can be, which is where this calendar comes in handy. This calendar will solve some of the biggest issues that social media users face—continuing to post badly-performing content, ignoring certain accounts and overwhelming others, missing important dates or events, and holes in the content calendar. When you run your own business, it’s hard to find time to publish Facebook or Twitter posts one-by-one throughout the day. To help save social media users valuable time, Hootsuite allows you to bulk upload up to 350 social media messages across social networks. Column 1: Date and time. The accepted DATE format is: mm/dd/yyyy hh:mm or dd/mm/yyyy hh:mm. Be sure to identify which format you are using when uploading your file. Times must be set in the future (at least 10 minutes from upload time) and should end in either a 5 or a 0, i.e. 10:45 or 10:50. You should always strive to have images fall within the recommended dimensions of each network. Why? A square is a square, right? Well, you never know when profile images will be posted elsewhere on social.